This is a memorial temple dedicated to Zhue Liang- the Martial Marquis of Shu in the three kingdoms period. This temple covers an area of 37000 square meters and the date of its establishment is unknown. The current temple was rebuilt in 1672 and is surrounded by old cypresses and classical red walls. The temple is subdivided into five sections: the Gate, the second Gate, the Hall of Liu Bei, the corridor, and the Hall of Zhuge Liang, all of which run south to north. The clay sculptures of Shu Emperor and ministers are a special feature. The most valuable cultural relic is a huge stele which is 367 centimetres in height and 95 centimetres wide. It is called as Triple success Stele. Visit this place to witness the love of Chinese people for their warrior. Tourists can buy the entrance ticket for the Dujiangyan Irrigation Project at the ticket windows of the Wuhou Shrine. Holding the entrance tickets, the tourists can take free bus from Wuhou Shrine to Dujiangyan Scenic Area. How popular is Wuhou Memorial Temple? 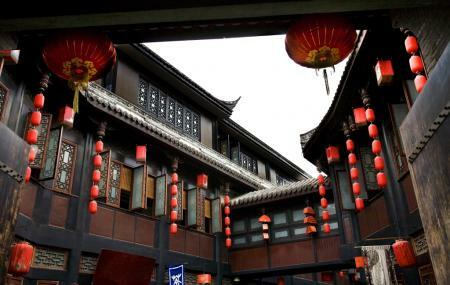 People normally club together Du Fu Cottage and Sanxingdui Museum while planning their visit to Wuhou Memorial Temple.